The table below gives a guide price to the most common repairs completed for iPhone and iPad repairs. Original Apple seller re-manufactured screens. Internal Replacements: These are components just as cameras, buttons and switches, charge port, speakers, proximity sensors, vibrating motors. This does not include microsoldering or any motherboard repairs. Multiple Repairs: on the same device at the same time can be given a discount of up to £15.00 off the total repair cost. Turnaround Times: To know the turnaround times for your repair please click hear or ask a member of staff. Business customers with more than 10 devices please call to speak with Daniel Beckford to discuss trade prices and discounts. If you are unsure of your device or have any questions please give us a call on 01494534008. 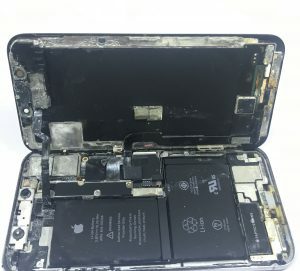 Apple iPhone X liquid damage recovery. Can this Apple iPhone X liquid damged from sea water be recovered? Its going to be a challenge but we will attempt to at least recover the data for this customer. At Gadget Rehab – High Wycombe we pride ourselves in being different from the competition by having the expertise to take on some of the most challeging electronic repair tasks. Have you got any challenges for us? Water damaged devices are a common occurrence. In the following mini document I will be discussing what to do when your device encounters liquid damage. A - carry on using as usual. C - switch it off and take it to a professional asap. If you answered A. then sorry your wrong! 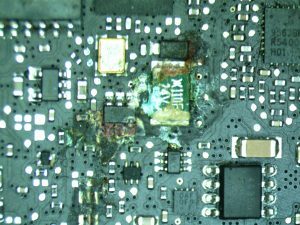 Water can get into your phone in seconds, and even if it continues working this water can start to cause some serious issues to your board. Why? Because when the electrical currents running through the device mix with the water it starts to cause shorts and corrosion. You may not see the effects of this immediately however sometimes even months later, you will start to have issues. By which point you have forgotten about the water damage, and may put the blame on something else (if taken to a professional they should be able to diagnose the issue and determine the extent of the damage). The cost to do repairs (if at all repairable) at this point will be higher than if you choose the right answer. If you answered B. then you are also wrong! Despite what you may have been led to believe by rumors/superstition rice does NOTHING in regards to helping resolve the issue at all. In fact in most cases it can cause more damage than help. As the granules can get jammed in ports e.g. charging. When water damage occurs sometimes your screen may go black, what a lot of people do is leave it in rice overnight and then put the device on charge - expanding on my previous point, water and electricity do not mix well! All this does is become a catalyst to creating shorts and further corrosion of your device, even though it may turn back on all that is going to happen is a repeat of why (A.) was also wrong. So if A. and B. were wrong then C. is of course the right answer! Yes if your device has water damage take switch it off and take it to a professional asap! Your first step post water damage is to power down the device. Take it to a technician as soon as possible. Do not attempt to charge the device or use it in anyway as this as mentioned can cause shorts, fry the on board chips and kick start the corrosion. 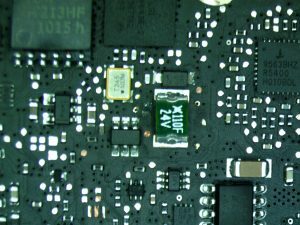 The technician will open the device and assess the extent of the damage, they do this by checking over the board and all major components. The tech will then start the ultrasonic cleaning process. Ultrasonic cleaning is process in which a ultrasonic frequency is put through a specially formulated solution. What this does is create millions of microscopic bubbles which are of roughly up to 45 degrees celsius. which aggressively pop therefore resulting in a clean board. The technician will disconnect the battery from the board and then begin the disassembly of the device. After they have removed the board they will dry it using compressed air. They will then look through a microscope to examine the board in depth to see if they can spot any corrosion that may have already taken place. Their next move is to place the board in a ultrasonic cleaning solution using a special PCB cleaner. They will then remove the board from the ultrasonic tank and the clean any deposits with IPA.. The technician then have another detailed look at the board under the scope to ensure the ultrasonic wash has been completed successfully. If you are lucky you will receive a call saying your device is ready to be collected. Here at Gadget rehab our repairs are conducted in a safe, secure and professional manner. Our technicians are experts in their particular fields. All repairs go through a 4 eye checking process to ensure the best outcomes. Gadget Rehab complete liquid damage repairs on smartphone, tablets, PCs and Laptops. Prices start from as little as £19.99 and take up to 5 working days. Turnaround times to suit you. We have the best turnaround times to support all types of lifestyles. *Subject to part availability and booked appointments.